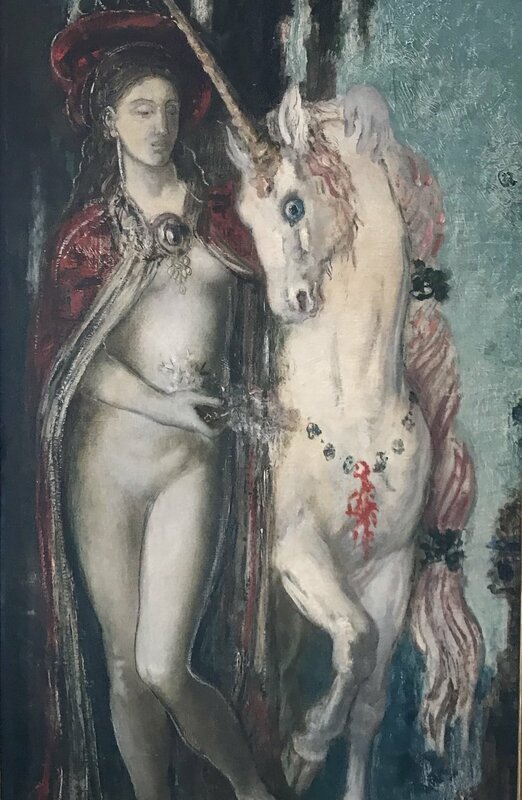 As I entered the late 19th century home studio of Gustave Moreau in the New Athens neighborhood of Paris, I imagined the artist greeting fellow artists, friends, curators and clients in the paneled, small and stuffy foyer and inviting them up the amazing winding staircase to his vast studio of dreams. Gustave lived in his parent’s home and had a large studio on the top floor located in Nouvelle-Athènes (New Athens). portrait of Gustave in front of the winding staircase. Gustave is an artist of dreams, and as dreams go, some are clear and crisp while others are blurred. But as you look closer at his monumental works, he not only tells the stories of his dreams in exacerbating detail, he abstracts parts of the paintings while drawing on top of them with ink. His techniques are very interesting for an artist of his times. I really admire him for the beautiful job he does of connecting man or womankind with animal-kind, something that is lacking in the world I live in. Notice the movement in the abstracted bulls head, The blurred horns and ears. see the elephants drawn over the abstract shapes giving them movement and detail. You have to love anyone who dreams of unicorns. After soaking up Gustave you can tour the tiny living spaces in the home. and get a good idea of how Gustave spent his time daydreaming when he was not painting or maneuvering paintings in and out of the windows.